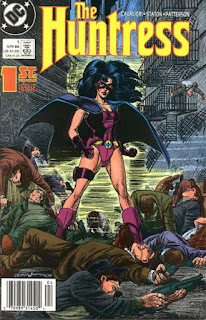 This Huntress Blog is dedicated to the DC character, Helena Bertinelli. 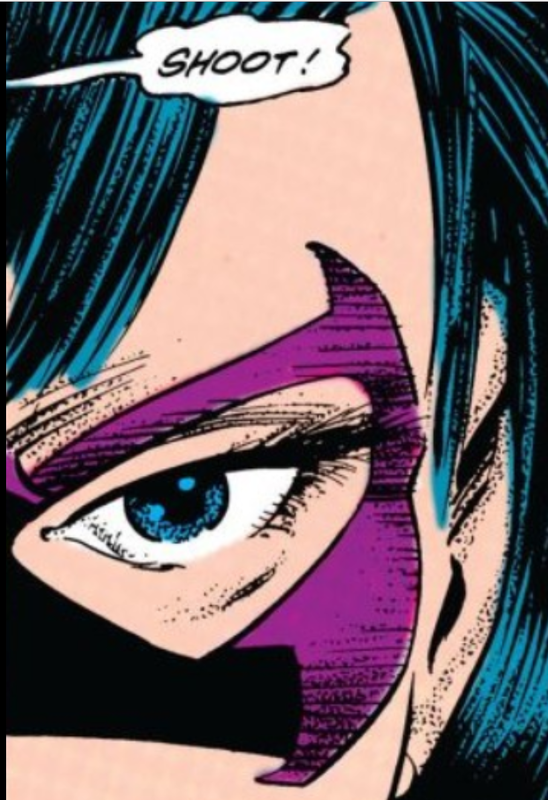 Many have enjoyed the character in the pages of Birds of Prey, but where did she get her gritty start? Follow this blog as we go on the journey of visiting these old stories, which created the building blocks towards the character we love today! 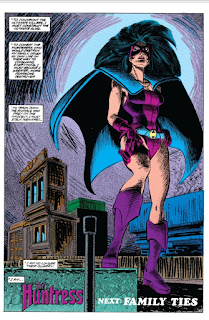 In the after math of Crisis on Infinite Earths, the Helena Wayne Huntress is no more. 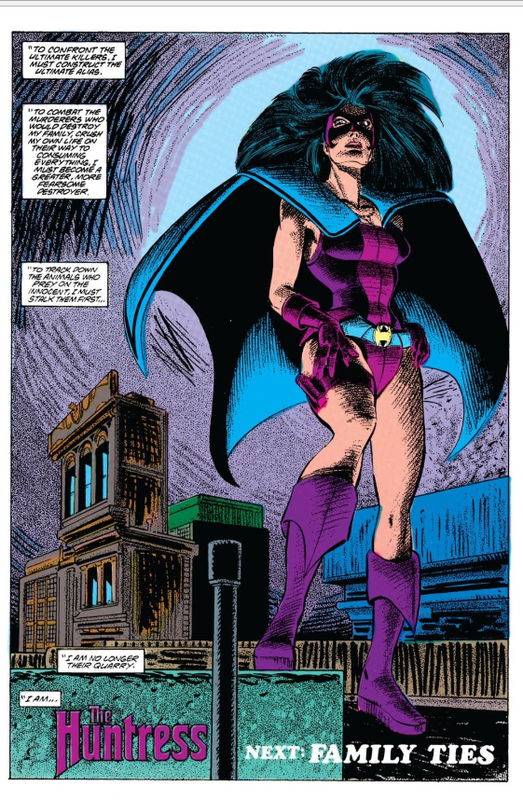 In her stead is this post-crisis character, Helena Bertinelli , daughter of a mafia boss, Guido Bertinelli. This is a comic that aims straight for the throat and never lets go, and as a reader, you wouldn't want it any other way. The story opens up with a woman walking home by her lonesome while being stalked in the distance. In this instance the threat is real. No lasers, martians, space ships, anti-life equation - nothing of the such at all. This is a horror that is happening right now to a fellow citizen as you read this blog. 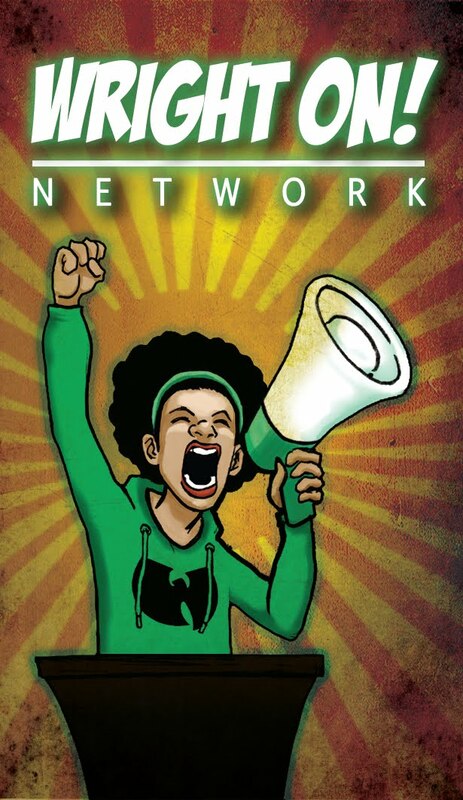 Already, the creators are letting you know that this is a gritty book. Although written in 1989, women being unsafe to walk alone is still prevalent today, unfortunately. From the jump, this book communicates that the atmosphere, gritty and grungy, will be the back drop for the titular character. 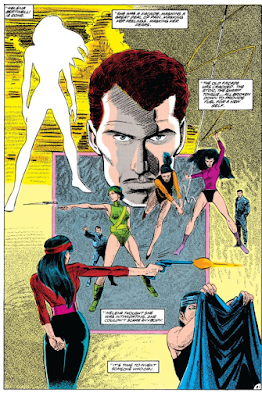 Opening panels focus on an assailant and his prey. A woman, walking by her lonesome, perhaps after a long shift at work. The perpetrator's knife is exposed without her even knowing that she is being followed. Before the perp can taste victory, The Huntress is there to foil this low-level, but all too common, crook. 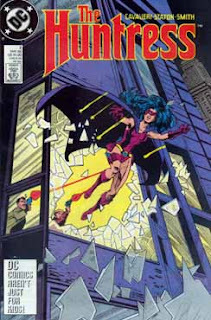 And the Huntress doesn't play nicely with these types, leaving him hanging from the rungs of a fire escape ladder in the alley he staked in, which is quite poetic. Huntress helps the woman to her feet, discovering her name is Helena Karabatsos. This is quite interesting, considering this reiteration of the Huntress is named Helena Bertinelli. The familiar name brings Helena back to her days in the old neighborhood. The sequence when Helena, who could be no older than 10 years old, visits Fat Angelo's store, which is kind of like a local corner store in the neighborhood. This is the most disturbing part of the book. Here we hear Angelo reaming out his son, Tony, for cluing in his friend that Angelo, his father, has mob ties. Apparently Angelo son's friends have disrespected Angelo a time or two. The son, thinking if he threw out his pop's mob ties, it would make the boys in the neighborhood respect him more. Fat Tony explains Omerta, which translate to "Silence". 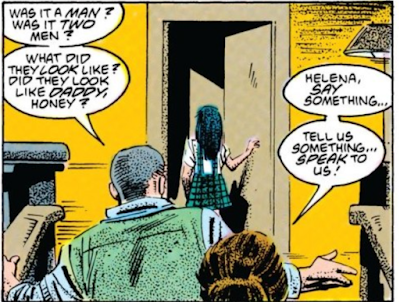 While Tony is having this conversation, a man with shades on is smiling at young Helena. While this creepiness is going on, we can hear Angelo talk about keeping your mouth shut and never talking to the police. This type of Code of Silence leads to a culture that breeds violence against women and toxic masculinity. The shade wearing man that was smiling at Helena in the store was waiting outside for her by his car. He tells Helena that he and her father go way back. Offering her a ride home and all the candy she could imagine He opens his car door for her to get in so he can take her home. Only they don't go home. They go back to his place. See, he is a member of a rival family from the Bertinelli's and yes, because of the feuding, a little girl, Helena, had to pay by being sexually assaulted. Although the act is not shown, the horror and torn clothes on Helena when she returns explain it all. This is heart breaking. And at such an early part of the book, it was hard for me to continue reading. 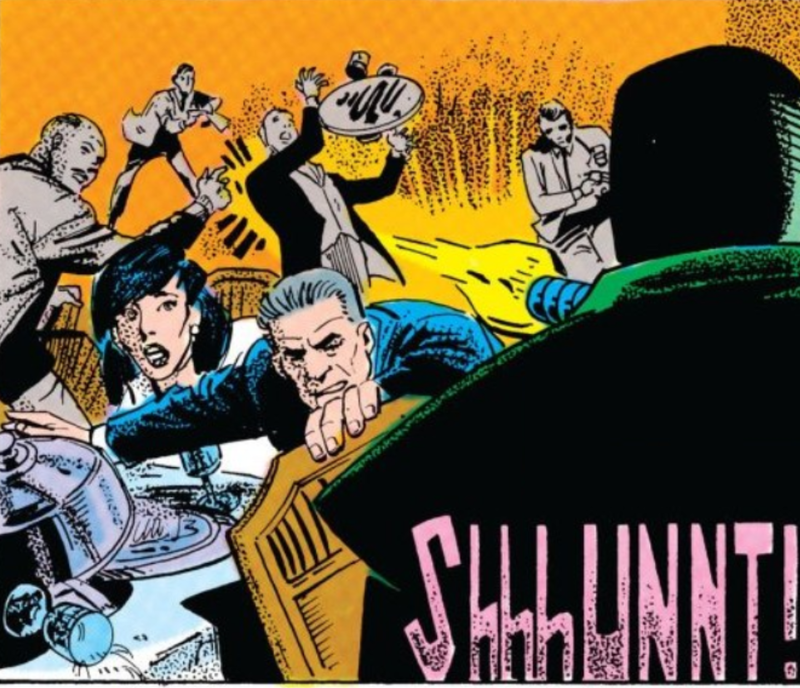 While Helena was missing, Guido Bertinelli, Helena's father, was ragging with anger, grabbing his underlings and threatening to do something, but the sad part is, when Helena was found, chances are, the father did nothing. Omerta. This was perhaps an act that went unreported because he kept it all in house. A dispute among the mob families. Helena's answer to the problem was to send Helena away to be educated at a rich boarding school with a body guard in tow. 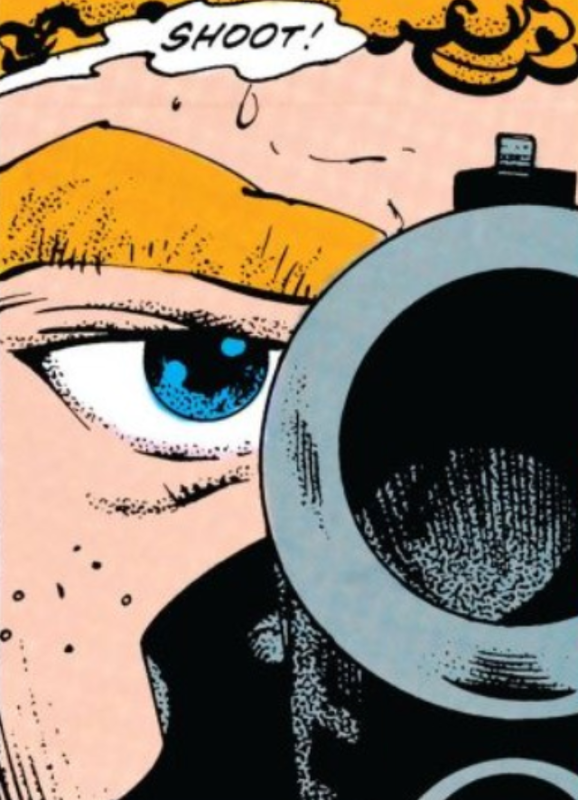 This body guard seems to really care for her safety, but Helena is trying to live a normal life without having to deal with this voyeuristic dude on the payroll, but knowing about comic book stuff, it seems as if this guy wants to do more than just follow Helena around campus. When Helena goes home on Holiday, her father is hosting a fancy dinner party, which is interrupted by a masked assailant who calls himself Omerta. And I believe he is actually using a silencer assault gun. This murderer kills everyone in the room save for Guido Bertinelli. In all the mayhem, Omerta, didn't realize Helena was only playing possum. Helena explains later that because she has been held up by a gunman before this event, she has always played scenarios in her head where she imagined what she would do if a mass shooting took place. This is our hero's normal, folks! After the blood bath at the Bertinelli's dinner party, Helena pays a visit to the family's estate lawyer, learning that she's inherited a large sum of money, for Helena is the only heir left in her father's fortune. In my interpretation of the scene, it reads as if Helena wasn't interested in her father's "dirty" money, which are my words, not Helena's. 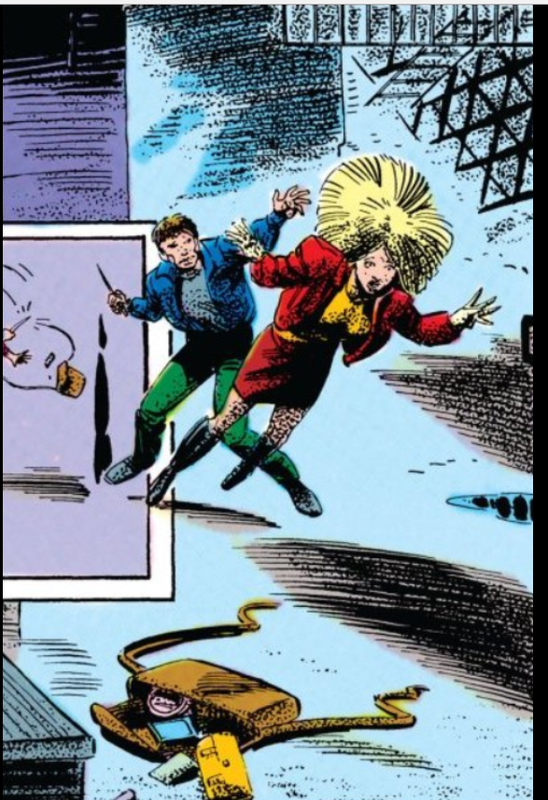 After leaving the meeting with the counselor, Helena walks to her car, where she is shot at multiple times. She zig zags, remembering one of her father's associates mentioning the maneuver helps when having to dodge bullets. What an upbringing! She goes back to her boarding school to pack her things; her life at the prep school is not safe any longer. As Helena is packing, a classmate of hers, I'm presuming a roommate, is trying to convince her to stay. The unnamed classmate even throws in that she has trained Helena to Olympic gymnast status, which I absolutely love. Now we know Helena is not just a random person, but is talented in a physical sense. Imagine, we are going to follow a character who is street smart, educated, and athletic. 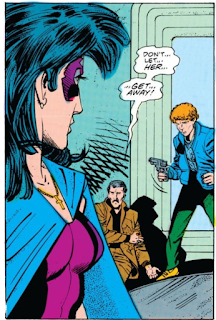 Now when she is visited by the body guard dude who told her that if she didn't want a protector, she better learn to protect herself, we understand why he was thrown into the story. Explaining he knew about the shoot out in broad daylight from earlier, and that she better move out to the countryside with him to train, Helena doesn't refuse. Now this isn't the smoothest transition I've ever read into a character going into trainee/trainer sequence, but the book "goes so hard" I am willing to bypass the clumsiness. I'm all in. Are you?